If you are a regular reader of my blogs you will probably have noticed that I often talk about visualising or visualization. A lot of other people also talk about it too, but do you what exactly it is – or do you know how to do it or even – what’s the point of visualizing? Well, many people are visualising each and every day to help them with general day to day life, or for health issues. Some people just use visualising here and there in their lives, or for specific times or situations. So to help you decide what’s the point of visualising, here are some tips and reasons. Research has shown that the brain cannot distinguish between real and imaginary. Really! So whether we actually do something, or visualise doing something, or brains believe we’ve actually done it. So, let’s say you visualise calmly and confidently taking your driving test, functioning in the exact way you really want to be able to do it. Then when it comes to actually taking your test, your brain believes you’ve already done it the way you visualised. To your brain it’s already an established memory, so it’s so much easier to do the test with calm confidence. You can see how this can apply to all sorts of things! When you visualise being the way you wish to be – calm, confident, healthy, strong, energized (and lots more) it can really help you to feel empowered. You really begin to get a sense of control over your life or certain situations. With health situations it shifts the power away from doctors, hospitals, medicine and drugs (they have their place, of course). It helps to feel a sense of control and that a person can cope / feel calm / be positive with situation or circumstances around the illness or health issues. When you start to see the positive effects of visualising, as I’ve mentioned above, and you begin to feel capable and empowered. Then the sense of self control begins to grow within you. So then it helps you to develop a greater belief in yourself and your own abilities. You can really begin to feel able to do the things you want to do, in the way you want to do them. Belief has enormous power for change! Think about a time when you believed in yourself and how easy it was to be successful or achieve that goal. We can always harness a little (or even a lot) more self-belief, so harnessing the belief in the point of visualising and how it can help is going to be a good thing! You don’t have to be great at seeing pictures in your mind. Some people just have a sense of how they want to be, others have a vague picture. Some imagine a scene on a kind of screen in front, others imagine being in the actual scene. Any way is fine, whatever is best for you. Write down or think of a few bullet points about what your goal is. Get really clear on this, no vague or wishy-washy desires here. Be specific. Identify how you want to feel. Where in your body do you want to feel this? Feelings could be about being happy, comfortable, steady, strong. 4. Be Aware of Your Body. Remember body language is hugely beneficial to how we respond. So how would your body want to look, be, respond. Is it shoulder back, a steady hand, head held high, smile on face? Make sure you have a few minutes, or longer to be free of distraction so you can focus on this and nothing else. Really enhance all these. Imagine turning up the intensity or the brightness or volume. Bring in all the sensory details, sights, sounds, smells, taste or touch if applicable. Pay attention to the detail of your thoughts, feelings and actions. Play through the scene in your mind a few times until it looks or feels how you want it to be. I’d love to know if this helps your self belief, empowerment in any way. Do please let me know in the comments space below or drop me an email or pop over to share on my Facebook Page. Hi, I’m Emma, Hypnotherapist in York with a particular interest in helping you with anxiety, stress, fears and phobias so that you can take back control of your thoughts and feelings. That way you can quickly and easily feel more able to cope with your busy life! There are no magic wands or quick fixes instead I give you personalised tools that work for you and fit with your lifestyle. 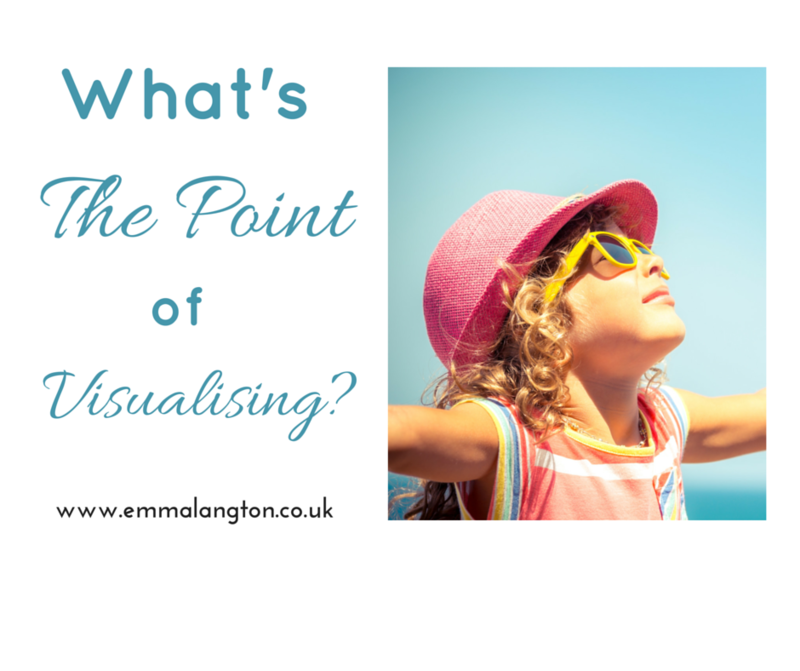 4 Responses to What’s the Point of Visualising? I used visualisation techniques to achieve a goal last year, I wrote down what it would look like like, sounds I could here, the way the air would smell and even taste. This really helped create a picture and a feeling to focus on. Great idea Louise. That’s the level of detail needed to make it seem real and it’s worth taking time over that. I love visualisation, the only time I fit it in is before I sleep and first thing in the morning when I wake. It certainly helps bring focus and awareness.